With the Olympics about to get underway, it’s worth recalling that the Helsinki games of 1952 spawned one of the greatest national teams ever to take the football field. Hungary’s superbly talented team, which lit up a gloomy post-war Europe, won Olympic gold in Finland, and were immediately tagged favourites for the World Cup in 1954. In between the two tournaments, Hungary taught England two bitter lessons, wracking up 13 goals against a nation who considered it had little to learn from “johnny foreigner” about the beautiful game. When Hungary arrived in Helsinki, they had been unbeaten for two years, although most of their successes were against Eastern Bloc states. They rarely ventured outside of the Iron Curtain and some experts were skeptical that their reputation had been truly earned. The 1952 Olympics saw the first real flickerings of the Hungarian “Golden Team” or to be more accurate, “The Magical Magyars”. Hungary breezed past Romania (2-1), Italy (3-0), Turkey (7-1) and Sweden (6-0) to reach the final. They beat Yugoslavia 2-0 in the final with goals from Ferenc Puskas and Zoltan Czibor. Stanley Rous, then Chairman of the Football Association, was so impressed by Hungary that he invited them to Wembley for a friendly game in November 1953. He surely didn’t realize what he had unleashed. Hungary were different. They wore lightweight kit and boots. They had different training techniques and they introduced a style of play and an accompanying formation that many would ape in the years that followed. In effect, with their “deep-lying centre forward”, they invented 4-4-2. This was progressive football at its best. They had a coach, Gusztav Sebes, who called his radical style “socialist football”, a forerunner of the Dutch “total football”, with every player in the team able to play in any position on the pitch at any time of the game. Sebes used Honved, the team that had been adopted by the Hungarian Army as his testing ground, and it worked spectacularly. 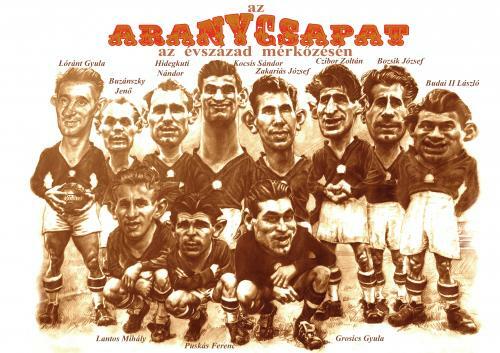 Hungary went unbeaten in 32 consecutive games, a record that has never been bettered/ The Hungarian team contained at least five world-class players – Puskas and Czibor, Sandor Kocsis, Jozsef Bozsik and the deep-lying centre forward, Nandor Hidegkuti. And then there was the panther-like figure of Gyula Grosics between the posts. England would soon learn all about these players. On a smoggy afternoon in November in old London town, Hungary tore England to shreds, destroying that in-built confidence – some might say arrogance – that England WAS the home of football. In fact it took barely a minute for the myth to be destroyed. Hungary ran out 6-3 winners to become the first continental European side to beat England. Puskas, who had impishly produced an impromptu ball-juggling display just before kick-off, scored a remarkable goal in puling the ball back and shooting past England keeper Gil Merrick all in one movement. The result sent shock waves through English football, but if that was bad, what happened in the Nep Stadium in May 1954 was positively seismic – a 7-1 defeat at the hands of the World Cup favourites. Puskas and his team-mates went to Switzerland for the 1954 World Cup rated as the best team on the planet. Who could stop them? The early games suggested it would not be West Germany, who they beat 8-3 in the group match. In that game, the Germans fielded a weakened team but it was still strong enough to inclict upon “the galloping major”, Ferenc Puskas, an injury that would cost the Magyars the ultimate crown. Hungary still marched to the final, despite the absence of Puskas, disposing of Brazil and Uruguay in two classic games. The little forward returned for the final, but he was far from fit and apart from hia goal, he contributed little. West Germany came back from two-down to win 3-2, surprising even themselves. It was the birth of a reputation – Germany’s resilience and ability to carve out results – but it was also the beginning of the demise of Hungary’s golden team, although it would be two years before they lost another game. The Hungarian revolution of 1956 proved to be the end of the road. While Honved were playing in Bilbao in the European Cup, the uprising was in full flow. The team decided not to return home, including Puskas, who eventually moved to Spain. Others went their separate ways, with varying degrees of success. Puskas, needless to say, enjoyed a second spectacular career with Real Madrid. Hungarian football was never the same again. Their national side regained some impetus in the mid 1960s, with players like Florian Albert and Ferenc Bene, and in the 1960s and 1970s, Hungarian teams were widely respected in Europe – clubs like Ferencvaros, Ujpest Dosza, MTK and Vasas represented tough opponents from “behind the curtain”.Today, the Hungarian game is at a low ebb. The galloping major is dead, most of his colleagues have long gone but at least the Nep is now the Puskas Stadium. One day, perhaps, Hungary will find the inspiration to rekindle some of the “Magyar magic”. Let’s hope so. Next Entry Why use Wembley when Wycombe will do?